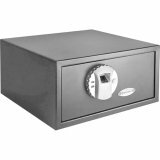 Mid-Sized BioMetric Safe With Keypad (Catalog Category: OUTDOOR OPTICS) by BARSKA at Freedom from Government. Hurry! Limited time offer. Offer valid only while supplies last.